We like the idea of the Windows Quick Launch bar, and even -- on rare occasions -- find ourselves using it. But we're always struck with the vague, disconsolate feeling that it simply isn't reaching its full potential. True Launch Bar is a vastly-superior replacement for the standard Quick Launch bar. Don't worry -- every Quick Launch function is also in True Launch Bar, and they share the same shortcut folder. However, True Launch Bar allows us to combine our shortcuts into groups and display them in convenient popup menus. Right off the bat it saves us space on our desktop and makes it a snap to launch our favorite applications. True Launch Bar is extremely configurable. We love the "auto-popup menus on mouse hover" option, and the "large icon" option makes working at high screen resolutions much more comfortable. Creating a new menu is as simple as right-clicking on True Launch Bar, and you can designate hotkeys to launch applications. 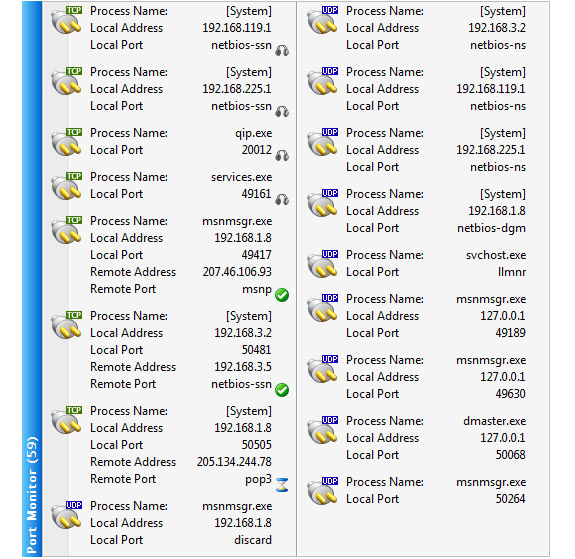 Best of all, True Launch Bar supports plugins like Mail Monitor, Weather Forecast, Media Control, System Process Monitor, Color Picker, Voice Recorder, Calculator, and dozens more! But don't take our word for it. Give True Launch Bar a try today and watch how quickly you ask yourself how you ever lived without it. 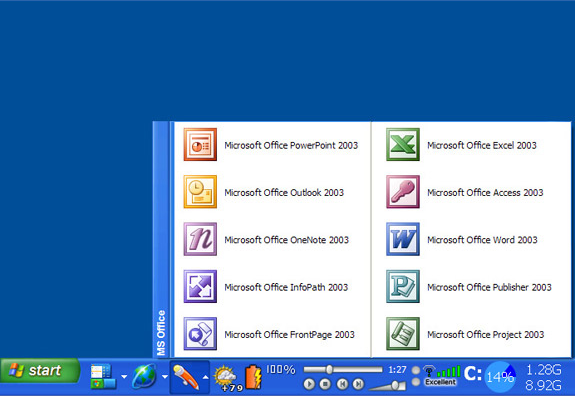 True Launch Bar is fully compatible with the standard Windows Quick Launch toolbar. 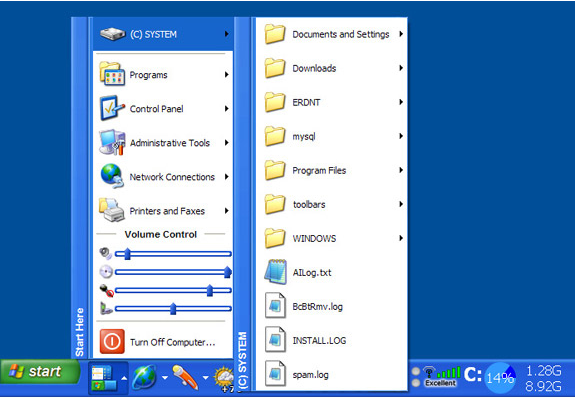 It uses the same folder for shortcuts, automatically reflects any changes, and can be docked into the taskbar. Create menus in the True Launch bar panel and place shortcuts there. Save space on the taskbar and give it personalized functionality. 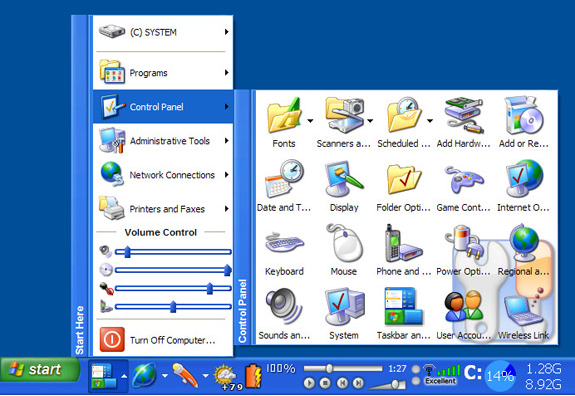 Completely supports Windows XP Visual Styles. You'll forget that it didn't come standard with Windows! 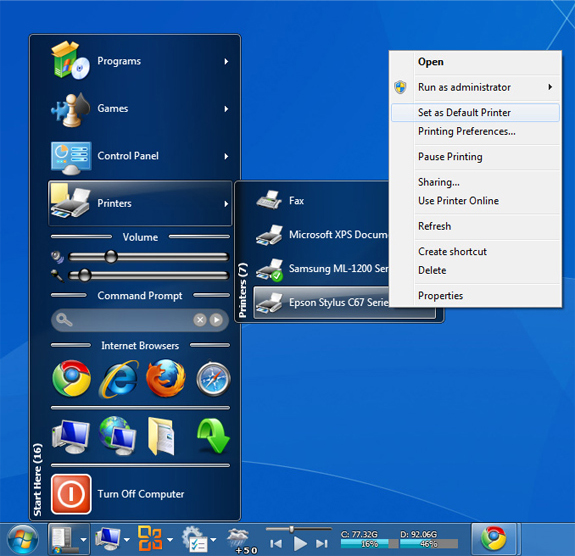 Create virtual folders that reside in a True Launch Bar menu. Right clicking provides a familiar Windows Explorer context menu. True Launch Bar fully supports Drag & Drop technology. 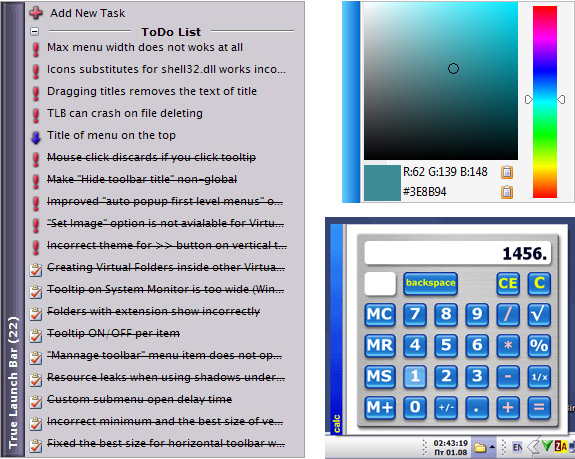 Simply drag shortcuts onto the toolbar or menu. Skinnable. Download them or create your own. Supports dozens of dynamic content plugins. Visit the plugins library to check them out. After you purchase True Launch Bar it may be used indefinitely. True Launch Bar is licensed per user, so if more people are going to use True Launch Bar you will need to purchase additional copies. 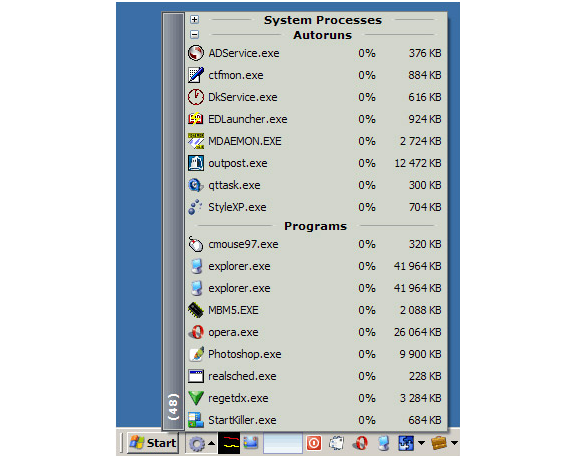 Each license allows installation on all owned computers, but True Launch Bar may not be used at exactly the same time on each of them. “I started out just to keep my Quick Launch icons in order, and I ended up with a powerful tool. True Launch Bar is simply loaded with features from the ability to add folders, group shortcuts, and run plug-ins. You can customize the way it works to suit your needs and the wayyou work. It supports skins, large icons, drag and drop, XPvisual styles, and more. Barnet It is so easy to exagerate a positing both positive and negative. That said, True Launch Bar is hands down, my favorite helper program I have ever installed on a PC, since 1980. I am an IT pro and I simply would NEVER run Windows 7 without Truelaunchbar. I am running 59 programs on my laptop and my shortcuts to lauch are orgainized in 4 truelaunchbar groups, in the order i want them to display. Do yourself a favor - download the trial and spend enough time to be certain you understand how it works. Well there is my 2 cents! Hans-Peter Guttmann Superb utility for Windows. Listing omits 100% compatibility with Windows 8, Desktop side, not Metro. Deep customization capabilities of True Launch Bar will allow you to make your Windows supremely efficient — no more searches or typing for apps, templates, or system controls. Place everything you need, often or rarely, one or two clicks away in an order that makes sense to you! with its idiotic, inconsistent dual interface . GrandMaster I rely on this program on my Win8 desktop and laptop. I sync the shortcuts in my toolbars via dropbox and my interface is the same across machines. Ela S. According to their website, True Launch Bar does work in Windows 8 as well. Windows without it would be a nightmare. Many thanks to the developer!!! John Terdik I use TLB on Win8.0 and Win8.1 IMHO it is a MUST have application. Guy Good Does True Launch Bar work with Start Menu X. If it does, are there any problems to be aware of? Christian User Great software ! Thanks to the developer !!! Gary Mugford Let me add to the litany of positive reviews. I use a multiple screen setup and have TLB glued to the bottom of the right-most monitor in the setting. It's the one that is, more or less, directly within my sight line naturally. I tried to remember the last time I actually used the start button (which I have modified with the also excellent AND inexpensive Start Menu X) over on the far left screen and I actually couldn't remember. And when I do (did? ), it's mostly for searching for a rarely used program. TLB is easy to learn and it's up to you just how far you go with the customization. Your time is yours to spend as you see fit. I spent a lot of time early on, but have decided just to go with the defaults for a while now and am very happy. The addon widgets return to me that that Microsoft has taken away from me, which makes me happy. And let me also laud the developer for making video's of each new feature as he releases them. There's many launchers out there, but when you measure capability vs. price, the graph has TrueLaunchBar as the best in show. Hans-Peter Guttmann True Launch Bar remains indispensable to Windows 10 users who want straightforward access to all the parts of their system and don't have time for the continuing idiocy of START. Dana User I love True Launch Bar and I can't see using the computer without it. I just checked and I purchased TLB for the first time in July 2005. I have a number of individual programs, those I want to easily reach, on the bar along with a number of menus with flyout menus to organize the rest of the programs in logical, to me, groups. Even though the license I have is a lifetime license I've purchased additional copies to make sure it stays in development. Speaking of lifetime licensing, their website offers lifetime licensing but there's no mention on this sale. Still, I gotta believe you're licensing for a lifetime when you make the purchase. Gosha Mazov The best of the best! One tip: install plugins for TrueLaunchBar. Reasons enough to pass this offer. Ray User @ Bertie Not sure where you're looking but according to their website the last update was May 8, 2017 so it appears that it is still being actively worked on and should definitely work on Windows 10. Bertie Brummel @ Ray User: Perhaps you should re-read their website. Latest stable release is from 2015, you are talking about a beta version (release candidate 1) from May 2017. A bit unusual, n'est-ce-pas? Bertie Brummel This soft was offered here a few weeks ago (see the last comments from February / March). BdJ showed www.truelaunchbar.com as link to the vendor's website then. There you can verify what I posted earler. Now the link to the website leads to Avangate. And there you won't find the development details from 2015 / 2017. Exactly the kind of of behaviour to let people lose trust in this vendor and BDJ too. Private User Really? I criticize the payment company for not selling me the software unless I give them my personal info and bitsdujour deletes my comment? How dishonest! Karl M. I'm using this for years now, for me and my family, and I'm absolutely happy with it. True Launch Bar is one of the best software tool available, an absolute must for Windows. Mariusz W " I'm using this for years now, for me and my family, and I'm absolutely happy with it." - I'm agree with it, I hope author never abandon this software and make even cosmetic update.